PHYLTER is an almost unknown Belgium band born in the late 70's in the borderline that divides Classical Symphonic from Neo Prog, a school that we'll be adding soon with the name of Neo Symphonic for those bands previous to the birth of Neo but already having some elements of this 80's sub-genre. For their first and only self titled release in1978 and upgraded to CD the year 1993 by the French Spalax label they counted with Jean-Marie Aerts playing rhythm Guitar ad guest. 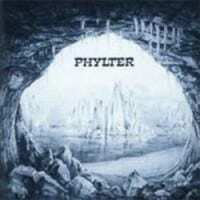 Despite the almost absolute lack of information, "Phylter" is easy to find in almost any good online music store and it's a pleasant surprise, their main influence is the 4 men era GENESIS blended with special skills with CAMEL and PINK FLOYD atmospheres plus a bit of fusion. The album is mainly instrumental and the vocals in very good English are simply delightful but their highest point is Patrick Phillippe, an incredible keyboardist from who there's also rare info. The album has all the ingredients that would make it desirable for any Prog collection, strong and dramatic changes and beautiful melodies, specially in the closer, the excellent 15 minutes epic "Down and Mood for Change". Honestly can't understand why they vanished so soon when their material is absolutely strong, if there's a chance get their album, it's worth.